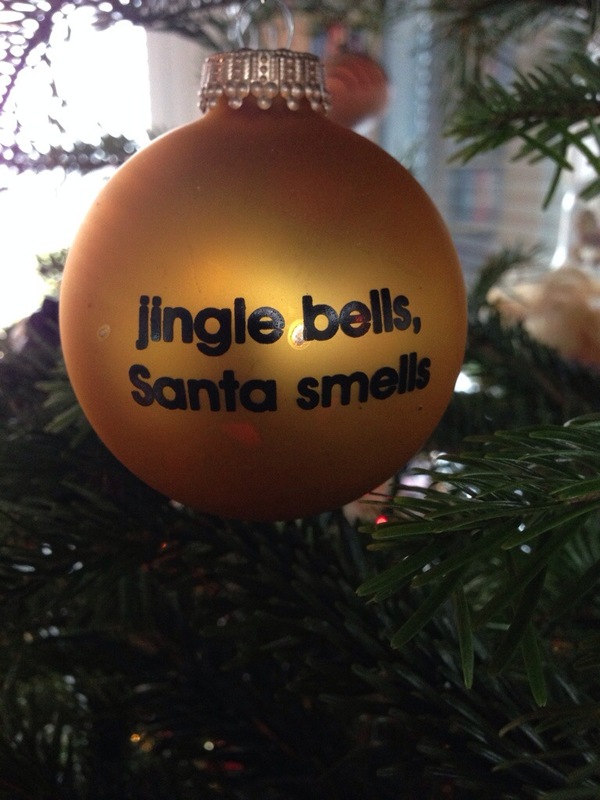 It’s the first year we’ve spent Christmas at home for a while and we put the Christmas decorations up this week. 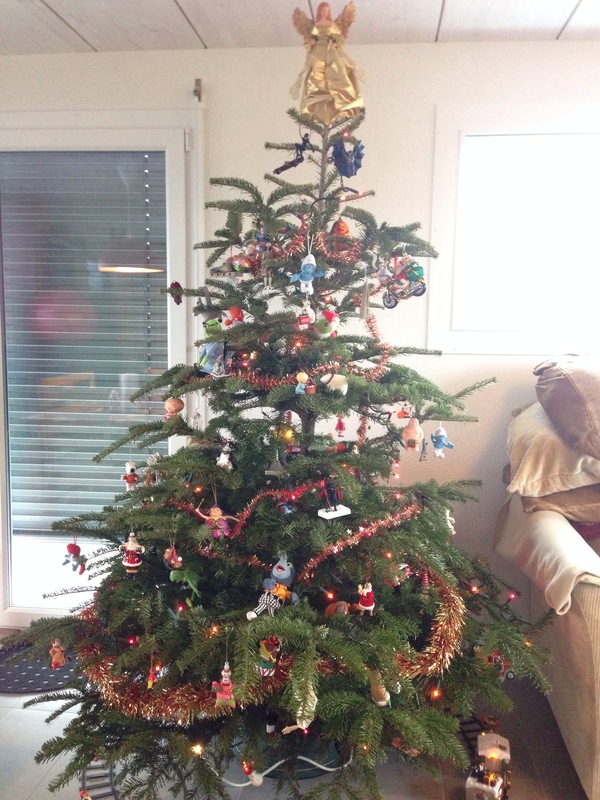 I love Christmas and we seem to collect more and more Christmas ‘stuff’ each year. In fact we have ten huge plastic boxes in the cellar which poor Scifi hubby had to drag upstairs so I could rummage through them (you don’t make a nine months pregnant Scifi wife rummage in boxes in the cellar – at least if you want to stay alive that is). I think it started with the nativity scene. Years ago I insisted we had to have one and although Scifi hubby really isn’t into religion he compromised when we found a nativity scene made from Playmobil (more on this last year). A couple of statues from Nightmare Before Christmas appeared a few years ago as did a singing Grinch and Shrek and Donkey with Christmas hats. Somewhere along the lines we collected a full set of four inch tall Muppet toys (from McDonalds I think) which now go on the Christmas tree. 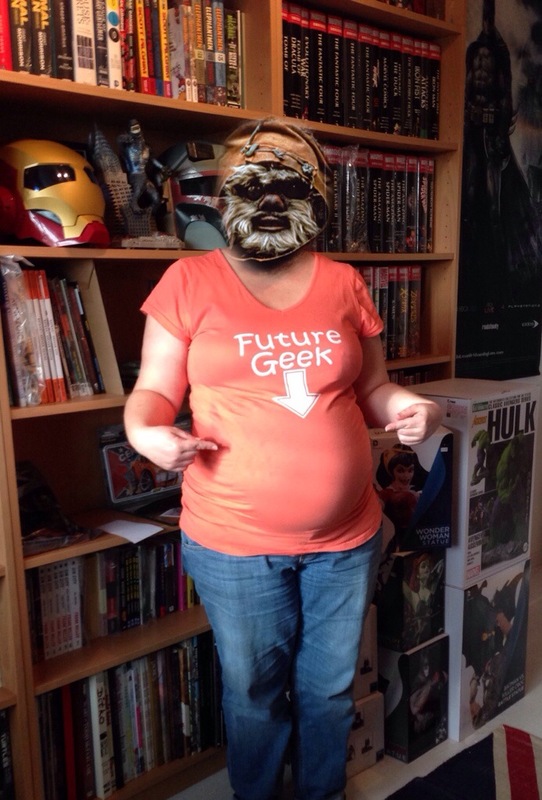 This year I got part way through putting the decorations and decided to go for a nap (I’m blaming Scifi baby). When I came back Scifi hubby had finished putting all the decorations up and the scale of the Scifi/movie/kitsch invasion became clear. Our Christmas tree may be the only one to include: Batman; Catwoman; two batmobiles one of which plays the Batman theme tune; Superman; Spider-Man; Darth Vader (in a Santa hat); Jabba the Hutt (on his plinth); King Kong; Dumbo; Peter, Stewie and Brian from Family Guy; a full set of Muppets; Shrek and Donkey; the Grinch; Playmobil Santa, angel and various people; Spongebob Square Pants and Patrick; Jack, Sally and the little henchmen Lock, Stock and Barrel from Nightmare Before Christmas; various Smurfs; German glass Christmas ornaments of Santa on a motorbike, Santa in a UFO, a fat cat, a fat fairy, a glittery hedgehog etc; and of course a Coca-Cola truck and polar bear. Oh and going round the bottom of the tree there’s a musical Santa Express steam train. I think the theme has become Scifi Christmas kitsch. 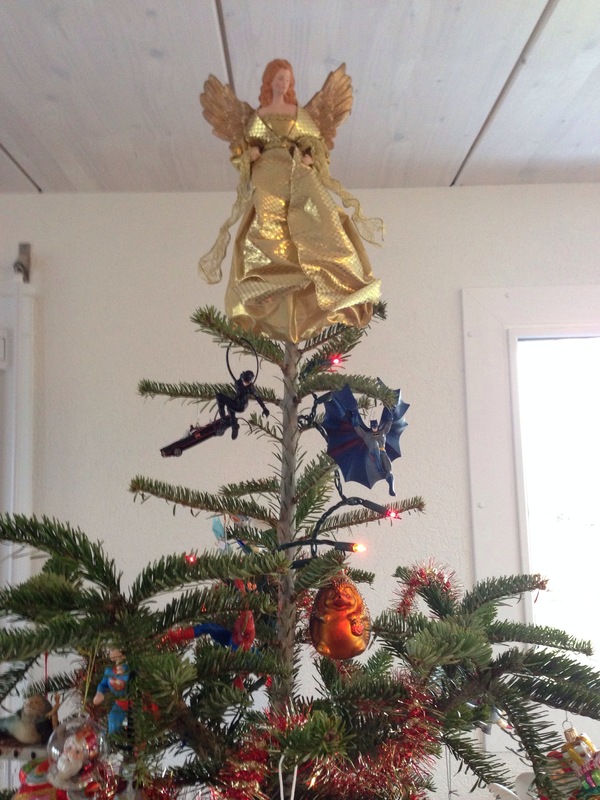 I suppose I should be glad we still have a normal angel on the top – although that could just be because he’s never found a suitable Poison Ivy figure. I’ve spent this morning pottering about the house and doing the final sewing for the nursery. I lost Scifi hubby a couple of hours ago but just assumed he was in his Batcave. I realised just now that there are some very strange noises coming from behind the cellar door. 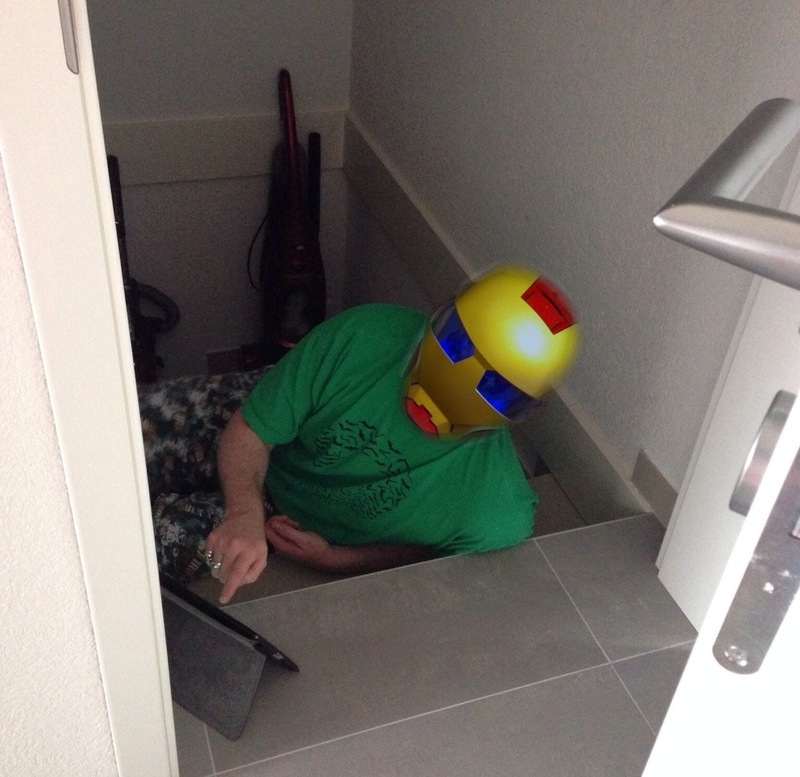 I opened the door to find Scifi hubby lying on the top of the cellar steps in his Hulk pyjamas with my iPad. Apparently he is playing the new Space Hulk app which is ‘amazing’, ‘brilliant’, ‘like being 13 again’. It is also very dark and needs wifi. Hence the cellar steps – dark enough to play but not too far from the wifi! I knew he used to play Warhammer 40,000 when he was a teenager but I thought he’d left this element of extreme geekery behind. Seemingly not. I think I’ll be lucky not to have the house invaded by little lead figures.